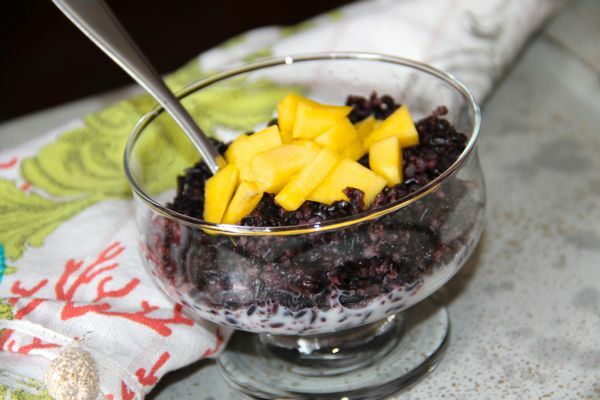 Forbidden rice shines in this decadent tasting dessert or breakfast dish. High in iron, zinc, amino acids, and packed full of antioxidants this nutty, aromatic purple rice pairs perfectly with coconut milk and mango. Black rice or forbidden rice looks black in the package but once cooked it is really a gorgeous dark purple hue. And guess what dark purple means … high antioxidant content! These are the same phytonutrients that give blueberries and acai berries their distinct colors and powerful health properties. Forbidden rice is aromatic and nutty in flavor and you can purchase it online or at many supermarkets. I prefer the Lotus brand that can be found at Whole Foods. Of interest is that its name “forbidden” stems from the fact that black rice was once only allowed to be consumed by the Emperors of China and not intended for the masses, thereby giving it the name of forbidden rice. Though not normally a fan of rice pudding, this is one pudding that I simply had to remake at home. I was first introduced to a similar forbidden rice dish about 14 years ago when my husband and I stayed at Domaine Madeleine, a picturesque bed and breakfast in the Olympic Peninsula. This recipe can be enjoyed as a dessert or even for breakfast. When I am making this for breakfast I reduce the amount of honey added, top it off with some additional fruit such as kiwi and add a bigger drizzle of almond milk on top. Black Rice or “forbidden rice” is rich in nutrients including iron, magnesium, manganese, potassium, phosphorus, zinc, molybdenum and selenium. High in antioxidants, black rice has many health benefits. Coconut milk is abundant in vitamins C, E and many B vitamins. By substituting “lite” coconut milk for traditional coconut milk we trim roughly two-thirds the fat and calories without sacrificing flavor. Almond milk is high in calcium, low in fat and calories. Turn the slow cooker on and add the rice, coconut milk, almond milk, vanilla, honey and ginger. Gently stir ingredients together and set on low for 4 hours. When ready, stir in chopped mango.